Contaminated farmyard manure can cause damage to vegetable crops in gardens and allotments. This contamination is caused by application of weedkillers to farmland used to grow hay and other forage which are then eaten by stock. In 2009/10 reports of weedkiller damage across many allotments and some gardens in the UK were traced back to farmyard and stable manures as the source of the contamination. Typical symptoms include cupped leaves and fern-like growth on sensitive plants. The shoot tips become pale, narrow and distorted, with prominent veining on the foliage. Growth generally is stunted, leaving most crops unusable. The damage is caused by hormone-type weedkillers, approved for use on grassland to kill broad-leaved weeds. The active ingredient responsible for most of the damage is aminopyralid. Clopyralid, found in certain lawn weedkillers as well as agricultural products can also give similar results. The herbicide binds strongly to plant material which when consumed by cattle and horses as silage, hay or haylage, can pass through the animals without breaking down. Manure from animals fed on treated grass contains chemical residues sufficient to damage susceptible crops. Bedding materials such as straw are less likely to be affected as aminopyralid does not currently have approval for use on cereal crops from which straw is made. The weedkiller is bound to the lignin in grass in the manure and released as undigested grass residues decay. Once released it affects many broadleaved plants. However, the weedkiller is broken down by soil bacteria and should all be eliminated by the following year. Because the weedkiller is bound to lignin, it is difficult to detect or to test for, however gardeners can carry out a simple test at home, see the advice on Manure Matters for more or our step-by-step germination test for weedkillers residues. The Health and Safety Executive (HSE) has investigated the risk to human health and concluded that produce from affected land is safe to eat. The complexity of the supply chain means it is not always easy to trace the source of the contamination. You try by contacting the supplier of your manure in the first instance to discover which weedkillers were used and who the manufacturers are. The HSE website holds information on both amateur and professional chemicals. Dow AgroScience, who manufactures aminopyralid-based products such as Forefront, is offering advice to gardeners and allotment holders on the Manure Matters website. To speed up the rate of breakdown of residues on contaminated land, rotovate or dig over the soil several times, preferably between summer and autumn when the soil is at its warmest. This ensures the manure is fully incorporated into the soil and increases microbial activity. Concentrate on mixing in pockets of manure, such as found at the bottom of manure-lined trenches. Residue levels in the soil peak at three weeks after digging before breaking down relatively rapidly. This means affected ground is usually safe to replant by the following spring. Scrape off any loose manure used as mulch around flowers, shrubs or fruit bushes. Return it to the suppliers or spread it on grassland. Failing this, put it in council refuse. Fruit trees and bushes damaged by contaminated manures are likely to survive and grow well next season. Feed the plants in the spring to encourage good cropping next year. 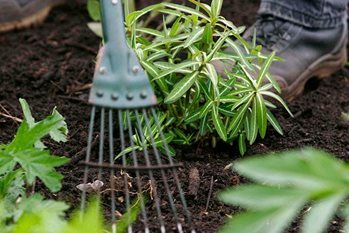 Flowers such as phlox and delphinium that show symptoms should be cut back at the end of summer and also given a well-balanced feed next spring. It is not advisable to compost ruined crops. If they cannot be incorporated into the soil, bag them up and put out with household refuse (NOT green waste collection). Seek advice from your council if they won’t accept green waste in domestic refuse. Unfortunately, residues in manure can remain for extended periods, even up to two years. The best advice is to return the unused manure to the supplier for them to spread on grassland. If this is not possible spread it on grassy areas. Well-rotted crumbly manure can be lightly spread on lawns in late winter. As a last resort, consign it to the council refuse. Long term storage is an option. The manure must be fully rotted down over several years before use. Products containing aminopyralid were temporarily withdrawn from supply, sale and use. Following investigation, new approvals have now been given by the HSE. Measures have been taken to ensure the risk of contaminated manure becoming available to gardeners have been reduced. However, gardeners should still be cautious about accepting manure from sources that cannot give assurances that the manure has not come from animals fed on grass or forage treated with persistent hormonal weedkillers, especially aminopyralid products such as Forefront. Don’t stop using mulch. Organic mulches are essential to improving soil structure and soil moisture. If a reliable source of manure is not available, try using an alternative source of organic matter such as garden compost, leafmould, composted bark or composted green waste from your local council. Although it is possible that composted green waste may sometimes be made from raw materials that contain weedkiller, lawn mowings for example, we have not found this to be a problem. With increasing awareness of the risks associated with weedkiller residues in manure and composted green waste, this problem with hopefully decrease in the future.